With our backs to the Arc de Triomphe we will now take a virtual stroll down the broadest and most well-known street in Paris..
How To Pronounce Les Champs-Elysées in French? Unfortunately, the name of this avenue is not pronounced in French the way it is spelled. Not by a long shot. Many English speakers pronounce it “layz tchamps eely zees”. But there are many silent letters in French. 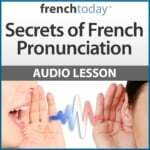 In French “les Champs-Elysées” sounds closer to “lay shan(a nasal AN sound) zay lee zay”. This way to write the French pronunciation is far from perfect, but if you say it this way, the Parisians will understand you. The avenue des Champs-Élysées—whose name, Elysian Fields, refers to the paradise of Greek mythology—means just one thing to most: luxury. Marie de Medicis was the first to look out over what was vegetable plots and fields in 1616 and have a tree-lined path put in to add on to her Tuileries garden. Expanded in 1667 and given its current name in 1694, it grew as a fashionable destination throughout the 19th century. Retailers were there in force by 1860 and in 1914 Louis Vuitton opened the largest travel store in the world at no. 101 (now the largest luxury store in the world). By the 1960s, however, the avenue lost some of its glitter. Today the Champs-Élysées is lined with global chain stores like Disney, the Gap, and even “McDo’s” (McDonald’s), and the sidewalks are chock-a-block with the worldwide tourist who shops there. Still, with a coffee and a rattan chair for props, sitting at one of the many cafés provides more entertainment than most of the movie houses along the avenue. Two shops I recommend stopping in (after our tour) are the Peugeot store at no. 136—to see fantastic automobiles—and perfumer Guerlain’s flagship at no. 68 which is an amazing array of spiral stairs, golden mosaic tiles, and chandeliers . . . oh, and of course, some of the most sumptuous scents in Paris. 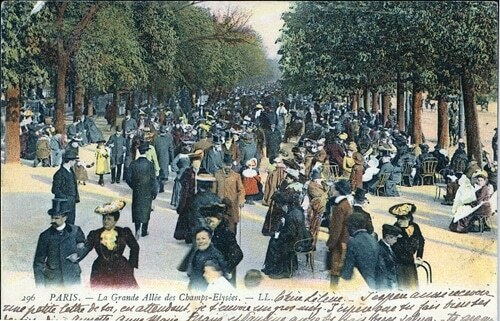 Beyond shopping, the Champs-Élysées is also where Parisians come out to celebrate (Bastille Day, the new year, winning the World Cup), sometimes to complain (about a government they’re displeased with), and occasionally to watch armies march by (Hitler’s in 1940, the liberation in 1944).